AS ever there was plenty of action involving Yorkshire clubs at the weekend. 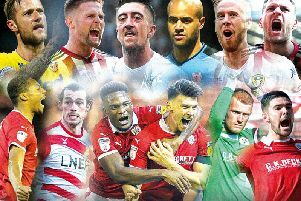 Here, we provide a slideshow snapshot of action from Burnley v Huddersfield Town (Bruce Rollinson), Sheffield Wednesday v Nottingham Forest (Steve Ellis) and Doncaster Rovers v Colchester United (James Hardisty). England's George Williams skips past New Zealand's Martin Taupau at the KC Stadium. Picture: PA.
We also feature some action of England’s Test triumph against New Zealand at the KC Stadium on Sunday (Press Association), as well as Sheffield Steelers’ dramatic overtime victory over Cardiff Devils in the Elite Ice Hockey League (Dean Woolley). Let us know below in the comments section which picture is your favourite this week. Robert Dowd celebrates his overtime winner for Sheffield Steelers against Cardiff Devils on Sunday night. Picture: Dean Woolley. Sheffield Wednesday's Jack Hunt holds off Nottingham Forest's Jack Hobbs and Daniel Pinillos. Picture: Steve Ellis.